The world famous historian, Will Durant has written in his Story of Civilisation that “the Mohammedan conquest of India was probably the bloodiest story in history”. Sam Harris has given lectures and written several books that muslims are not peaceful and follow terrorism to spread their death cult. Several west scholars in recent times openly argue that the concept of god in islam is figment of imagination. The history also support their claims. India before the advent of Islamic imperialism did had internal wars among princely states – but it was not fought like scavenger dogs attacking innocent animals in night, as mlecchas muslims started doing after they invaded India. There were plenty of wars fought by Hindu princes. But in all their wars, the Hindus had observed some time-honoured conventions sanctioned by the Shastras. The Brahmins and the Bhikshus were never molested. Peasants and farmers were never tortured. The cows were never killed. The temples were never touched. The chastity of women was never violated. The non-combatants were never killed or captured. A human habitation was never attacked unless it was a fort. The civil population was never plundered. War booty was an unknown item in the calculations of conquerors. The martial classes who clashed, mostly in open spaces, had a code of honor. Sacrifice of honor for victory or material gain was deemed as worse than death. But barbaric muslim ruler ardent follower of islam changed that. They demolished our religious structures, historical places or captured temples to revamp it as their own – this is/was true nature of islam which continues to be so. 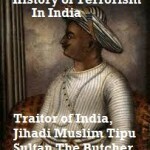 Shameless Indian historians and film makers, who promote this wicked and mass-murderer as great Indian ruler should be thrashed in the same manner – Akbar used to thrash pseudo-chamchas like them, though being Hindus they were opponents of Hinduism, toe lickers of this cruel muslim ruler. 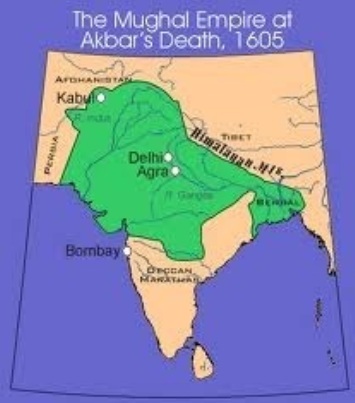 Akbar is considered as the great Mughal emperor who put the Mughal empire on a firm and stable footing, with a reliable revenue system and with expansion of its borders deeper into Indian heartland. There is a belief prevalent in the present day India that Akbar’s rule was secular and tolerant of the native Hindu faith. This belief is fostered by the Indian history texts, Hindi movies like Mughal-e-Azam, Jodha Akbar (Jodha never married to Akbar, even in fabricated history), a TV serial on Doordarshan and the fictional tales of Akbar and his Hindu court jester Birbal. 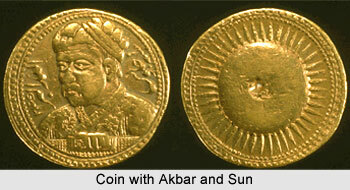 Although Akbar did abolish two obnoxious taxes on Hindus namely the pilgrimage tax in 1563 CE and Jizya (A tax stipulated in the Koran to be paid by Zimmis or unbelievers) in 1564 CE, only to be reinstated and then later abolish, he did this several times, his rule was better compared ONLY to the other Mughal and Turko-Afgani barbaric rules. This article illustrates this with two specific historical events. First, Akbar like all Mughal rulers had the holy Muslim title of GHAZI (SLAYER OF KAFFIR, non-Muslims – infidel). In mughal era, slayer of Hindus were considered as Ghazis. Since India was dominated by Hindu population – with different princely states – fragmented states across India. Like Timur Lane and Nader Shah, AKBAR HAD A VICTORY TOWER ERECTED WITH THE HEADS OF THE CAPTURED/ SURRENDERED ARMY OF HEMU after the second battle of Panipat. Later, AKBAR AGAIN SLAUGHTERED MORE THAN 30,000 UNARMED CAPTIVE HINDU PEASANTS AFTER THE FALL OF CHITOD ON FEBRUARY 24, 1568. This article also relates another historical event which shows the true dubious nature of Akbar’s religious beliefs which he used merely to suit his convenience. 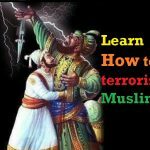 Mughals came to India as invaders, their sole purpose was to rule India and rob off her wealth in most possible ways and promote their barbaric islam religion, thereby converting Hindu locals. Akbar’s grandfather Babar founded the Mughal dynasty. Babar (babur) was a direct descendent of Timur Lane from his father’s Barlas Turk side and of Chengiz Khan the Mongol from his mother’s side. The name Mongol had become synonymous with barbarian by the 16 th century CE, hence Babar was proud of his ancestry from Timur, whose descendents were regarded as ‘cultured Turks’. In a twist of poetic justice, the dynasty founded by Babar became known through out the world as Mughal – an adaptation of Mughul, the Persian word for ‘Mongol'(1). In Marathi also Mughals are referred to as ‘Mongal’ which is close to Mongol. Babar’s son Humayun was defeated by Sher Shah Sur, an Afgan at the battle of Chausa on 26 June 1539. But Humayun later defeated Sikandar Shah Sur in 1555 to regain Delhi. As per islamic laws laid for rulers, A Ghazi can only rule non-muslims, and to prove that he is Ghazi, that demonic ruler should show inhumane, barbaric traits and kill kafirs to take blessings of *anti-God Allah. (*How can a God order killing of innocent people – in the name of religion. The world is getting aware of this truth. That’s why their so called God is correctly referred as anti-God by most of the recent authors), due to their barbaric past and recent inhumane acts across globe – while composing this, Googling “anti-God Allah” – threw up more than 19 million results. You can imagine the extent to which people (even ex-muslims) think that Islam is definitely not driven by Godly principles. On 24 th January 1556 CE Mughal ruler Humayun slipped while climbing down the steps of his library and fell to his death. The heir to the Mughal throne, 13 year old Akbar was then campaigning in Punjab with his chief minister Bairam Khan. On February 14, 1556, in a garden at Kalanaur, Akbar was enthroned as emperor. The other rivals for the throne of Delhi were the three Afgan princes of Sher Shah. However the main threat to Akbar’s future came not from the Afgan princes but from a Hindu. Hemu, the Hindu chief minister of Afgan prince Adil Shah led a surprise attack on Delhi in October 1556 . The Mughal forces under its governor Tardi Beg Khan panicked and went into a sudden ignominious flight. This was Hemu’s twenty second consecutive victories in successive battles. After the capture of Delhi, Hemu set up himself as an independent ruler under the Hindu title of ‘Raja Vikramaditya’. At this juncture against the advice of most nobles, Akbar and Bairam Khan took a courageous decision, to press forward against Hemu’s undoubtedly superior forces. On November 5, 1556 the Mughul forces met the army of Hemu at Panipat. In this second battle of Panipat, the Mughals were saved by a lucky accident after a hard fight which looked more than likely to go against them. An arrow hit Hemu in the eye and although it did not kill him it had pierced the cerebral cavity enough to make him unconscious. In any battle of this period, the death of the leader meant an end of the fight, and the sight of Hemu slumped in the howdah of his famous elephant, Hawai was enough to make his army turn tail. Shah Quli Khan captured the Hawai elephant with its prize occupant, and took it directly to Akbar. Hemu was brought unconscious before Akbar and Bairam. Bairam pleaded Akbar to perform the holy duty of slaying the infidel and earn the Islamic holy title of ‘Ghazi’. Among much self-congratulation AKBAR THEN SEVERED THE HEAD OF UNCONSCIOUS HEMU WITH HIS SABER (2,3,4). Some biased historians claim that Akbar did not kill Hemu himself, but just touched the infidel’s head with his sword and his associates finished the gory ‘holy’ work. However the latter version seems inconsistent with the events that followed. After the battle Hemu’s head was sent to kabul as a sign of victory to the ladies of Humayun’s harem, and Hemu’s torso was sent to Delhi for exposure on a gibbet. Iskandar Khan chased the Hemu’s fleeing army and captured 1500 elephants and a large contingent. THERE WAS A GREAT SLAUGHTER OF THOSE WHO WERE CAPTURED and IN KEEPING WITH THE CUSTOM OF HIS ANCESTORS TIMUR LANE, CHENGIZ KHAN and Babar, AKBAR HAD A VICTORY PILLAR BUILT WITH THEIR HEADS. Peter Mundy, an Englishman travelling Mughal empire some 75 years later (during Jahangir and Shah Jahan’s rein), found such towers were still being built. (Reference 2 gives pictures of a sketch by Peter Mundy, and Mughal painting of the tower of heads during Akbar’s reign, also shown below). Hemu’s wife escaped from Delhi with the treasure and Pir Mohammad Khan’s troops chased her caravan without success. HEMU’S AGED FATHER WAS CAPTURED AND ON REFUSING TO ACCEPT ISLAM, WAS EXECUTED (3). This is the ‘glorious’ history of barbaric Akbar’s victory at the battle of Panipat. Rajputs were very brave and like Marathas they protected their Kingdom from the barbaric mughal rulers for longer time. Despite nearly five centuries of Muslim occupation of India, Rajasthan in 1567 CE was still almost entirely Hindu. Akbar infiltrated the area by marrying into Rajasthan’s ruling houses and by steadily capturing various forts on the eastern fringe of Rajputana. But the senior house of Rajasthan, Rana of Mewar proudly refused any alliance with Mughals. Akbar’s army started a campaign for Chitod in 1567. Rana of Mewar, Uday Singh left his capital, the great fort of Chitod to be defended by 8,000 Rajputs under an excellent commander, Jai Mal, and took himself and his family to the safety of the hills. Akbar arrived on October 24, 1567 and laid a siege of Chitod. Akbar’s huge army’s camp stretched for almost ten miles . Akbar planned two methods of assault -mining and building a ‘sabat’, a structure which provides the invading army a cover of a high wall as it progresses ‘infinitely slowly’ towards the fort wall and tightens the noose around the fort. The mining proved disastrous since an explosion of a mistimed second mine claimed Akbar’s nearly 200 men including some leading nobles. As the noose of ‘sabat’ tightened, Akbar forces lost nearly 200 men a day to musket fire from the fort. Almost four months after the siege, on February 23, 1567, a musket shot fired from the Mughal army killed Jai Mal. Some chroniclers claim that this shot was fired by Akbar himself. With the death of their leader Jai Mal, the Rajputs for a while lost heart. That night flames leapt to the sky as THOUSANDS OF RAJPUT WOMEN PERFORMED JAUHAR (act of self-immolation, the term is a corruption of Jay Har – meaning Hail Shiva). This act of Jauhar gave rise to Sati where Hindu women preferred to die then become s*x object of muslim ministers or rulers. These brave women of Rajasthan preferred jumping into a roaring fire, to being captured by Mughal Akbar and become s*x slaves of his harem like rest of thousands of women in harem. Later events do lend credit to their astute judgement. This was the THIRD JAUHAR IN THE HISTORY OF CHITOD – after invasion of mughals. Next day the Rajputs under a new young leader Patta Singh donned on the saffron robes – Kesariya, in preparation for a fight to death, flung open the gates of the fort and charged on to the Mughal army. Patta Singh, his mother and his wife, fought war bravely and duly died in the ensuing battle as did many Rajput warriors. Later, the victorious Mughal army entered the fort of Chitod. At the time there were 40,000 Hindu peasants and artisans residing on the fort besides the Rajput army. AKBAR THEN ORDERED A MASSACRE OF ALL THE CAPTURED UNARMED 40,000 HINDUS, some artisans indeed were spared and taken away but THE SLAIN AMOUNTED TO AT LEAST 30,000 (5,6,7,8,9) Akbar was particularly keen to avenge himself on the thousand musketeers, who had done much damage to his troops, but they (remaining 10,000) escaped by the boldest of the tricks. Binding their own women and children, and shoving them roughly along like new captives, the Rajput musketeers successfully passed themselves off as a detachment of the victorious Mughals and so made their way out of the fort (5,6,7,8,9). The MASSACRE OF 30,000 CAPTIVE HINDUS AT CHITOD BY AKBAR has left an indelible blot on his name. 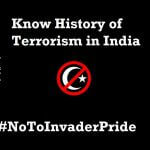 No such horrors were perpetrated by even the brutal Ala-ud-din Khilji who had captured the fort in 1303 CE. Abul Fazl, Akbar’s court chronicler is at pains in trying to justify this slaughter. In the later period of his rule, Akbar later had statues of Patta and Jai Mal, riding on elephants, installed at the gate of his imperial palace at Agra – to continue his effort of converting Hindus to barbaric islam. Although probably intended as a compliment for their heroism, it was open to misconstruction since in the earlier history Jai Chand had placed a similar statue of Prithvi Raj Chauhan at the gate of his palace (as a Dwarpal) at the Swayamvar of his daughter Sanyogita. Sir Thomas Roe, an Englishman who visited Chitod some fifty years later, found the fort deserted. In fact, it remained a firm tenet of Mughal policy throughout the next century that fortifications of Chitod, which till then was the capital of the then strongest Hindu Rana, should remain unrepaired, perhaps as a lesson to Hindus who dared to take on the Mughals (5). Rana Pratap Singh of Mewar, son of Rana Uday Singh, kept the Rajput resistance to Akbar alive and tried to reclaim the glory of Chitod. When Akbar failed to convert Hindus – who preferred to oppose or rather die than become muslim. Akbar thought of becoming another mohammed. In the later part of his rule, Akbar founded a new religion Din-e-Ilahi in which he vaguely tried to combine practices of Islam and Hinduism. He observed Muslim, Hindu and Parsee festivals. He had Jesuit priests in his courts. However, this founder of Din-e-Ilahi was practically illiterate. Till the end of his rule only seventeen nobles yielded to Akbar’s wishes (and pressure) and converted to his new religion, among whom Raja Birbal was one. And the concept of new religion to fool Hindus lead to gradual death of its own. None of Akbar’s children adopted his religion. To top it all, Jahangir, Akbar’s son from his Hindu wife Hira Kunwari, later killed a Kaffir (Hindu infidel) and gained the holy Islamic title of Ghazi. It is indeed false that Akbar drifted from orthodox Islamic practices and became more tolerant of other religions. However, more often Akbar used and twisted religious principles to his own advantage. Let us look at one such example. Navratnas (Nine gems) during the reign of King Vikramaditya (Chandragupta II) of the Gupta Empire. Akbar followed the concept of King Vikramaditya and formed his own Navratnas. The only difference between King Vikramaditya and Akbar’s nine jewels was that Vikramaditya never had flattery as the eligibility to promote a deserving candidate as one of the Navratnas while Akbar only liked those individuals as Navratnas who were his stooge and fawners. Legendary Musician, well known for his voice and music, Tansen was born as Ramnatu Pandey, a Hindu and learned who took gyan of music under the tutilage of Great Sage Haridas. 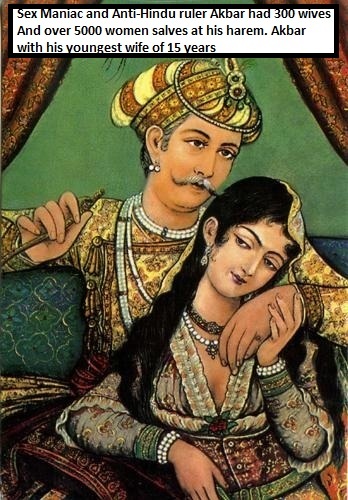 Mehrunissa, daughter of Akbar, wanted to marry Ramnatu Pandey impressed by his singing and music. Ramnatu Pande was forcibly converted to Islam and made Miya Tansen, a muslim, under strict guidance of Akbar. Akbar also included Tansen in his Navratnas – nine jewels of court. Akbar is known to have converted a noted veena player, Raja Misar Singh to islam and giving him the name, Naubat Khan. Naubat Khan was gifted money and felicitated as official Veena Vadak for his conversion to islam. Weekly ceremonies of forcibly converting Hindus into Islam were carried out by Akbar’s administrators and ministers. Just like during other Muslim rulers, Akbar’s rule also destructed many temples, killed Hindu inhabitants and cows and looted their wealth. Temples were converted into mosques and madrasas or simply destroyed to rubbles. Akbar remain muted to these gruesome pursuits and never stopped his commanders to discontinue the barbarous acts. Akbar killed an unconscious Hemu (a Hindu) to become a ‘Ghazi’ at the second battle of Panipat, he later ordered slaughter of all the captives from Hemu’s army and had a victory tower built with their heads. Similarly, Akbar later on ordered a massacre of 30,000 plus unarmed captive Hindu peasants after the fall of Chitod on February 24, 1568. Are these the characteristics of a truly ‘secular’ and ‘tolerant’ emperor ? These events reveal Akbar’s true nature during early part of his reign. Should Akbar be called ‘Great’ and ‘Secular’ only because he was falsely posed to be a lesser despot than the rest of the Mughal emperors ? In the entire Indian history of thousands of years NOT A SINGLE HINDU KING EVER SLAUGHTERED THOUSANDS OF PRISONERS OF WAR. In fact the Hindu virtue of generosity to the surrendered (SharaNaagat Vatsal Bhav), came to haunt them later. Prithvi Raj Chauhan defeated Mohammed Ghori over 16 times and generously let the loser mleccha free each time. This generosity of Pritviraj was paid back barbarically by Mohammed Ghori who after having finally defeated Prithvi Raj once in 1193 CE, blinded him and carried him to Afganistan in chains where Prithvi Raj died an ignominious death. The Mughals were the descendents of brutal Mongol Chengiz Khan and the Turk Timur Lane. 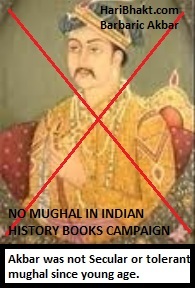 The above incidences clearly show that MUGHAL EMPERORS WERE FOREIGN AND NOT INDIAN, AND AKBAR BY HIS ACTIONS WAS NO EXCEPTION. Thus to call Akbar as ‘The Great’ is nothing but an insult to all civilized societies and especially Hindus – who are native Indians. This article also has shown Akbar’s dubious use of religious principles to suit his urge for s*xual pleasures. If we are to take example from the 20 th century, then even the Nazis did not kill 30,000 prisoners of war in cold blood during the second World War. However scores of Nazis were sentenced to death during the Nuremburg trials for their War Crimes against POW. Readers are encouraged to read more about the true brutality of Mughal empire. And spread the truth to maximum people possible. 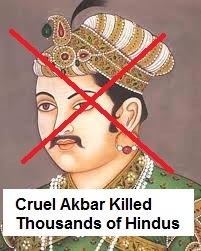 If Akbar ‘the epitome of secularism’ was so cruel and brutal, then what must have been the extent of brutality of Timur Lane, Babar, Aurangzeb and Nader Shah? 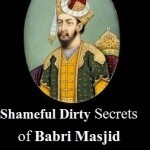 Why Indians are fed fabricated stories of mughal rulers veiling their heinous, barbaric crimes? Why not factual history taught in schools? Why Ramayan and Mahabharat were revoked from schools to place these foreigners as role models, was there a ploy to islamize India by their descedants, as dreamt originally by these mughal looters and murderers? Why don’t the Indian School texts give these details of Akbar and What else are they hiding? Is it because tainted past of pre-independence leader of a party (most ruled in India) had muslim parents or one of his daughter married to a muslim later. So their islamic past haunts them to behave like a wicked, cunning, fanatic muslim who can go any length to promote his religion with fake theories to support them. Mlecchas (muslims) who killed our men, r@ped our women, demolished our temples to build tombs and mosques should be given reservations ? But then resevrations was supposed to be given to oppressed people and not oppresors (muslims)? **REFERENCES, The Cambridge History of India, Encyclopedia Britannica and other works based on Akbar-nama by Abul Fazl. Please read other posts and comment or share with your friends in social media sites. 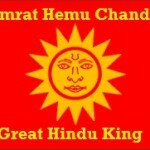 Our objective is to SPREAD truth and facts among all Hindu brothers and sisters. Unite Hindus for prosperous and strong Bharat. 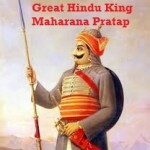 who is hindu rajput Jhod bai ? that was akbar’s wife ?? On that day Hemu was riding an elephant named Hawa’i. Suddenly an arrow struck the eye of that infidel and came out at the back of his head. His army, on seeing this, took to flight. By chance Shah Quli Khan Mahram with a few brave men came up to the elephant on which was the wounded Hemu, and would have shot an arrow at the driver, but he cried ” Do not kill me ; Hemu is on this elephant.” A number of men immediately conveyed Hemu as he was to the king (Akbar). Bairam Khan representedthat it would be proper if the king with his own hand should strike the infidel with a sword, so that obtaining the reward of a ghazi (warrior of the Faith) he might use this title on the imperial farmans. The king answered, ” I have cut him in pieces before this,” and explained : ” One day, in Kabul, I was copying a picture in presence of Khwaja’Abdu-s-Samad Shirin Qalam, when a form appeared from my brush, the parts of which were separate and divided from each other. One of those near asked, ‘ Whose picture is this ?’It came to my tongue to say that it was the likeness of Hemu.” Not defiling his hand with his (Hemu’s) blood, he told one of his servants to cut off his head. Those killed in the defeated army numbered 5,000 in addition to those who fell in various places round about. In Gobindwal, which is on the river Biyah (Beas), there was a Hindu named Arjun,1 in the garments of sainthood and sanctity, so much so that he had captured many of the simple-hearted of the Hindus, and even of the ignorant and foolish followers of Islam, by his ways and manners, and they had loudly sounded the drum of his holiness. They called him Guru, and from all sides stupid people crowded to worship and manifest complete faith in him. For three or four generations (of spiritual successors) they had kept this shop warm. Many times it occurred to me to put a stop to this vain affair or to bring him into the assembly of the people of Islam. She constantly wrote to Khusrau and urged him to be sincere and affectionate to me. When she saw that it was of no use and that it was unknown how far he would be led away, she from the indignation and high spirit which are inherent in the Rajput character determined upon death. Her mind was several times disturbed, for such feelings were hereditary, and her ancestors and her brothers had occasionally showed signs of madness, but after a time had recovered. At a time when I had gone hunting, on Zi-1-hijja 26th, 1013 x (May 6th, 1605), she in her agitation swallowed a quantity of opium, and quickly passed away. It was as if she had foreseen this behaviour of her unworthy son. Thanks a lot for sharing the additional information. Thanks for enriching the content with your additional views. The courtiers of several mughal emperors actually highlighted their gruesome atrocities as if they were prestigious act and in doing so they revealed evil face of islam and its followers. There are many types of information which needs to unearthed. Because around 1100 writers right from Humayun to Aurangzeb had written thousands of pages around the so called anti-Vedic achievements of these muslim invaders. We are also trying hard to get these resources from relevant medium and highlight true history to our fellow native Indians – Hindu brothers and sisters. check the picture of the coin on the right side. I know about these people and how they are increasing,they also cheat Hindus by offering them free of cost education,amenites and facilites.The congress government is responsible for the above. The question is how is congress government responsible? Ans-Uneducated Hindus and minorites in India go and vote for this party. In 3 generations,10X10X10=1000 will be the population of people from a non Hindu religion.While Hindus 2X2X2=8 or max to max 10. Fact of the matter is decimation of Hindu unity since last several centuries is the main reason that non-Vedic people multiplied enormously. The only OBJECTIVE of each true Hindu in this country should be to Unite Hindus and make them aggressive to the core. And pretty soon we can realize teh dream of Hindu Rashtra – free from non-Vedic people whose main agenda is to destruct Hinduism and Bharat. 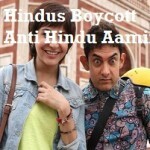 We all should work towards strengthening Hindus economically while dealing, shopping only with Hindus. Yes lalit ji my response is for the above link. 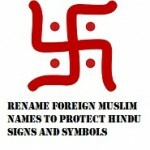 I feel very soon,Hindus will realise this problem and let’s hope to fight togeather! Yes together we can and we will win. Unity among us is key strength. Once again you have done such a wonderful job,Hats off to you sir! I would request you to make an article on your website about castism.Some people think that Hindus have castism prevalent(though we have castes in Islam and Christianity also).So I would request you to alight this topic through your esteemed website. May Bholenath ji bless you. Please google “how non-Hindus multiplied in India” to know step by step propaganda on how Hindus were decimated in India – targeting Hindu unity and Varna system. Sanskrit is the language of the Gods and is considered to be eternal. NASA conducted research in space and found that the cosmos is resonating with sound of ॐ, the divine sound ‘OM’ which originated formation of Universes and Planets. Western scientists then started researching Sanskrit and Vedic texts to gain knowledge on astronomy and secrets of space. As per Puranas, Lord Shiv chants ॐ , so this could be sound of Lord Shiv himself in super ultrasonic interaction not heard by primitive sense organs that humans bear. Perfect information. I thought the truth of the Indian Muslim cruelties would never ever emerge. 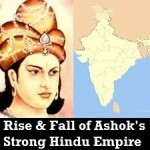 Its so saddening that the Hindu people had to bear the brunt of 1000 year Muslim rule in India. The uncultured Muslims had arrived as barbarians to our great land, so cultureless r muslims that till date they are the same. 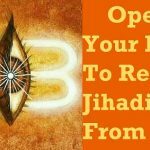 India has been afflicted with type of cancer called Islam and whether we like it or not the afflicted part has to be amputated. Though we cannot change the history, we have control on how we can make our future bright and supreme. We all should learn from past mistakes of our ancestors and NEVER again give any chance to Non-Hindu, Non-Vedic people to gain higher positions, ministeries, army or sensitive departments. Moreover, such anti-national communities should not be given any govt sponsored beneficial schemes. Being assertive is only way forward with such people. Sir I always liked the sites that makes a Hindu proud abt their culture and ur site is one of that kind and bcoz of the grt influence of hindu religion in my mind I always aspire to bcome an Indologist.Sir I would like to ask you abt one more thing Is Qutub Minar is the world’s largest astronomy instrument of the world i.e the Merustambh? ?will you pls cnfrm it? Mehrauli, derived from the Sanskrit word Mihira-awali. It was the town developed solely for the purpose of astronomy and research around it. It was constructed to give due respect to the well known astronomer Mihira of Vikramaditya’s court who lived during that time with great mathematicians, scientists and technologists. It is also called Dhruv Stambh or Vijay Stambh used for astronomical observation on huge scale. There were many constructions which were demolished by barbaric mughal emperors. The 27 separate pavilions signifying 27 constellations of the Hindu Zodiac were constructed which integrated astronomy with astrology. It was developed to know positive compilations of astrological signatures with astronomy. It was great structure to know everything about astronomy and astrology – never heard before anywhere in the world at that time. It was not only the world’s largest but also most advanced and oldest astronomical structure. Thanks Veena Ji for giving feedback in rewriting the history of world to give rightful importance to great Vedic culture, which presently people are not giving due recognition to. There were about 60,000 major temples across India which were converted or demolished by mughal emperors – these were either made into mosques or tombs. I will be covering several temples and surely the one you suggested above. First I will start with Indian temples where Vedic religious places are converted in fake godman temples (articles like this – https://haribhakt.com/hindus-open-your-eyes-sai-baba-is-fake-god-exposed/); so that Indians revert to praying their gods by not falling into trap of islamic or western propagandas. 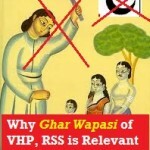 I will be free after 16th May 2014 and would start publishing more such articles. I am doing research and will be posting a chronology of articles on these barbaric mughal rulers, in the meantime, you can have a dedicated compilation on the other side of Shah Jahan from these links …it provide details on various aspects of how inhuman shah jahan was. Once again, what a fantastic article, one day we’ll definitely write the true history. 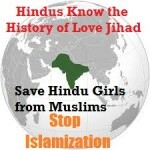 Thanks for your support, we need to spread the awareness among our Hindu brothers and sisters as we cannot expect non-Hindus to acknowledge the facts since they are leaving no opportunity to islamize and catholicize India. Spread and share the posts with your friends and colleagues. Jai Maa Bharti. Sanskrit is the most ancient langauge ….request to some of my southern sisters and brothers, please do not fall prey to fake propaganda of Britishers which they enacted to demean Sanskrit (the most scientific language ever known to mankind and spoken by our Rishis and Gods). Sanskrit is now preferred by NASA and AI scientists to develop world’s first self-thinking Artificial Intelligence based computer. Sanskrit is time immemorial. “u mean southern ” ; its only tamilians who oppose sanskrit , coz of there atheist believes (periyar movements ) and not karnataka , andhra , kerala . You stand corrected, though there are overlapping of anti-Sanskrit sentiments across many Southern states. But you are right on spreading hatred and prejudice against Brahmins (North and South both) by such movements; which were not only supported by periyar but dalit centric church sponsored evangelists. The responsibility lies on us to spread the truth of Varna System (Authority based on Karma and not by Birth) which was original essence of hierarchy system in Ancient India. Anything that decimates unity of Hindus by proclaiming to lead anti-Brahmin, anti-Jat, anti-Dalit or anti-Kshatriya movement is acting at the behest of anti-Hindu brigade because each one of these are Hindus and its a ploy to dilute Hindu unity in the name of Atheism and modernization. Edited the response to respect your sentiments. 1) 24hour bhagwad gita…ramayan…bhagwat…ayurveda…sanskrit tv channel. Indians and particularly Hindus rise to the occasion whenever such situation come. This time Hindus are getting united and aggressive, you would soon see the positive results in coming elections. Culturally, we Hindus should be united against cow slaughtering, corrupting ganges and division created by malicious reservation system. The only criteria should be POOR Indian and not caste system, which is ruining Indianness and country’s unity. We are taking this adverse situation as an opportunity to Unite Hindus. Excellent very true information provided. Thanks a lot. We hope so, one day we might be able to REWRITE true History of India.